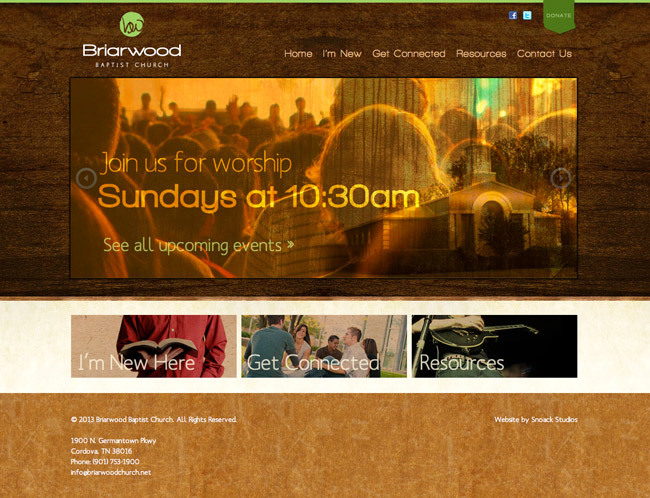 Briarwood is a warm and friendly church in Cordova, Tennessee, and we wanted to emulate their great atmosphere in this new website. Warm textures in the background give the design a very friendly and welcoming appearance. The color palette is composed of colors from their branding materials, including a bright green color that we used throughout the site as an accent and it provides a bright, cheery touch. 2 san serif fonts from their branding can be seen throughout the website, giving a nice modern feel. We also set up a great Online Sermon area that allows far-away visitors (or those that couldn’t make it that day!) the chance to stay up to date with each Sunday’s sermon. Our custom setup organizes each sermon by date, including some information on each one, and you can listen to it right from your computer online.